Winners in Tuesday's Unionville-Chadds Ford School Board elections: top left, Gregg Lindner, top right, Victor DuPuis, bottom right, Frank Murphy and bottom left, Kathleen Meehan Do. It looks like for the second straight election the Unionville-Chadds Ford Board of Education will see wholesale changes — with newcomers Victor DuPuis, Kathleen Meehan Do and former director Gregg Lindner winning election, Tuesday, based on unofficial election results from Chester and Delaware counties. Incumbent Eileen Bushelow won easy reelection running unopposed. The board of nine will have three new members as of next month. Frank Murphy was the lone incumbent returned to his seat, with board president Timotha Trigg — who has served two terms on the board — losing by 44 votes in Region C to Lindner — who served briefly on the board. 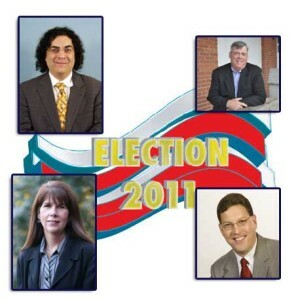 Both Lindner and DuPuis lost close elections in 2009 for board seats. In Region A (East Marlborough and West Marlborough), DuPuis held off Rob MacPherson 820 to 760. In a highly visible and contentious Region C (Chadds Ford and Pennsbury) race, Do and Lindner edged Trigg and Jones, while Murphy the lone candidate running on both the Democratic and Republican lines ended up as the top vote getter. In Region B (Newlin, Birmingham and Pocopson) Bushelow ran unopposed and won, getting 1,416 votes. There were just 20 write-in votes. EDITORS NOTE: We’ll have more on this, including reaction from the candidates as the day and the week goes on. Again….the election is over. These nine folks have to find a way to work together, craft a workable budget, cope with numerous small and large crises. Beating up one side or the other is not productive. I heard Oprah Winfrey say that one of the things she learned from doing her show for 25 years is that people just need to be heard. It is clear that the voters have been heard. I think this is a really nice post and you are obviously committed to working as a team to solve the important issues related to the education of our children. I supported the UCFSD board before the election and I support the new one. We all have to work together as a team of elected officials, parents, readers, taxpayers and others to make this a wonderful community. Frank, thanks again for your post. Now here is what a representative of the people sounds like!!!!!! Kudos to you Frank for 1) realizing the public opinion, even if it differed from your own, and 2) vowing to do a better job and be part of the solution. Compromise and “common ground” have become fighting words the last few years in politics…it’s nice to see someone who is not afraid to do that for the good of the district. Can’t you bring something better to the table than that? The voters spoke and all we’re hearing from some it about some dark conspiracy, as if the voters hereabouts are a bunch of unschooled twits. Kind of insulting to the voters, isn’t it? From here, and I’m well right of center, mind you, one side had their act together, played fairly clean and won, while the other side kept hurling charges, magnifying small issues as if they were Watergate “retire-resign, really?” while at the same time provoking warfare in the community. It was a poor strategy and it failed, much like trying to sneak the auditorium height past the township. I don’t hold a lot of hope for this, but hopefully the new group will be better strategic thinkers. I do not believe that you are in any position to comment on my qualifications. It is you who dwell on the fact that I volunteer my time to provide election literature to those who appreciate their right to vote and wish to be informed. I owe you no apology for that. The last time I checked, this was America and I had rights that include my political beliefs. I never once pushed those beliefs on anyone. Instead, I viewed my involvement as an opportunity to set a good example for my children. Feel free to criticize me for that. On the other hand, I am certain that I did point out that my 20+ years of experience as an internal auditor was a valuable commodity. I think the fact that I have spent my entire adult life analyzing processes, operations, and programs for ways to cut costs, generate revenue, increase efficiency and add value and excellence to an organization give me somewhat of a competitive advantage. I can assure you that I am very good at my job! As for my not attending school board meetings, I guess I must be invisible. Just because I am not loud and obnoxious, does not mean that I am not present. On the contrary, I am a firm believer that it is the empty barrel that makes the most noise. As for my involvement in school functions, I can truthfully say that I never missed a school event, always volunteered at least once as a field trip chaperone, was a mystery reader, an assistant teacher for St. Cornelius CCD classes and a team manager for my son’s travel soccer team. As a matter of fact, I picked my kids up everyday after school during their elementary years. Now that they are older, I frequent the middle school and high school. Again I owe you no explanation, but I think that my involvement in my childrens’ lives, activities and education, as a single parent far surpasses that of many households where there is a mother and a father. Okay — the election is over. Maybe everyone needs to dial back a bit here…and go easy. While we may have philosophical disagreements with folks, the election is over now. There has been ample opportunity over the last few weeks to make such points. I think, in fairness — and maybe just a hint of compassion — maybe folks should ease up a bit on those who lost Tuesday. It was a close race — this vote doesn’t really represent anything like a mandate, so let’s keep it in perspective. And just from a kindness standpoint — let’s allow those who lost to do so without being subject to further criticism. This sort of loss stings — a lot — and I know from personal experience. Clearly, there remain differing thoughts on how the school district should be governed and the biggest challenge of the coming months and years will be bridging those gaps. That’s not something the nine folks on the school board can do alone, it needs to be the entire community. I’d like to see that process start here, to be honest. No one who was on the ballot Tuesday is a bad person. Each, at their core, cares about the future of the community and the district, even if there are differing views on how that is best served. Let’s try to keep that in mind when we post. Mike is right. The election is over. I’ve run for office and lost so I do know how it feels. I’ve been a Committee-person so I know how much work is involved and how thankless it can be. I’ve worked the polls all day and been frozen, sweaty, sunburned and sore. My personal and heartfelt apology to anyone who took what I said personally. Politics is a tough game. Wow! I am truly grateful for your post Frank. This is what the entire election was about for so many of us. It sounds like you have finally heard our voices and i thank you for these words. Just interesting…Chester County Voter Services reports the number of voters who voted straight party line (pulled the R or D lever). In all Chester County precincts within Region C, a total of 259 voted straight R, 125 straight D.
Frank Murphy was on both ballots, so he benefited from both the 259 R and the 125 D for a total of 384 votes. When you subtract these numbers from the total votes cast within Region C (Chester County), you end up with the number of voters who specifically selected the candidate. The community has spoken that it wants a more diversified board. Hooray for the changes that were brought about by this election. Moving forward, we can only hope the new board finds the proper balance of what is best for the students and the taxpayers. 1. It does not include the Delaware County (CFT) which is part of Region C.
2. It assumes that anyone who voted straight ticket didn’t really “vote” for the candidate they knew or wanted. 3. It assumes that no Democrat who voted straight ticket wanted to vote for Frank Murphy. 4. Most importantly, it ignores the fact that the Do/Lindner camp, working with the Kennett Area Democrats and the Chadds Ford Republicans, told all voters (and had written instructions for their poll workers) to “bullet vote” and not include Frank Murphy. You knew that, right? 5. In 2009, when Frank Murphy ran against Greg Lindner one-on-one and without Mr. Murphy having the cross file, Murphy won the Region by about 225 votes. I don’t doubt the “community spoke.” That’s what elections are all about. What I don’t accept (because all empirical evidence points to the contrary) is that the Do/Lindner victory was a victory for non-partisanship. They lost 5 of 6 precincts but won the election because of one precinct with exceptional high Democratic party registration and turnout near 100%. Wow…honestly, I think all of this post-election analysis is way off the mark. When you attempt to divine a voters’ intent, you’re really getting into the deep end in terms of voter modeling. I agree that Observing has some points on divining straight ticket and drawing conclusions — although there are a certain number of GOP and Democratic voters who do so (a lot more GOP, typically). As for Crosslands: I pretty much totally reject those arguments. While Kendal has been a reliable bastion of Democratic votes for more than a decade — with similar turnout numbers — Crosslands has tended to be more of a mixed bag. I would argue that any of the other Region C precincts typically vote with a higher GOP voter performance than we see for Democratic performance with Pennsbury North 1. In reality, the race was lost, from the GOP perspective, by failing to win the other five precincts by enough. Look at the differential in votes in Pennsbury North 2: Trigg/Jones ran 6 to 8 votes short of the top of the ticket, with a 10 vote differential in Pennsbury South 2. We see a similar erosion in Chadds Ford. What does that mean? Enough Republicans and GOP-leaning independents apparently voted for Do/Lindner to make the difference. And even that — without a deeper look at the numbers, turnout history and other modeling data I would typically build into a post-election number crunch — is kind of a rough educated guess. Your mileage may vary. Mike: I’m going to get some hard numbers from 2009 and get back to you. My recollection is that the vote percentages from the 5 precincts T/M/J won were about the same or perhaps slightly down from 2009 when Murphy won Region C by about 225 votes. I agree you can read the numbers different ways as to voter intent. My point, however, is that to say it is a vicotry for non-partisanship is baseless. P-N1 is heavily Democrat and they voted either straight ticket for did the “bullet vote” exactly like the Do/Lindner camp told them too. And it wasn’t just the polling place handout – it was on their website, etc. The ’09 PN1 numbers weren’t that special — D turnout was less than spectacular. And you’re always going to have some down ballot undervote, but in these sort of races, I think the drop off was higher than typical. Again, in terms of performance, I don’t seen PN1’s D performance as any more special that GOP performance in CF — a factor that should more than cancel, and leave the race to the other precincts in Pennsbury — and that didn’t happen. And again, don’t attempt to view the effect or operation of the Democratic Committee through the lens of the GOP Committee — there is a significant difference in how well lit, Web sites, etc. work because of rather large cultural differences between the voters and organizations. D efforts on turnout in Chester County only work on a grassroots basis — the Deomcrats are essentially a Pomeranian in a dog fight against a boxer — there might be a lot of noise, but not that much damage gets done. Trigg/Murphy/Jones won five of the six precincts constituting Region C. Do/Lindner one one precinct: Pennsbury North 2. Pennsbury North 2 is unusual for Chester County as it contains the Crosslands community, which has an overwhelmingly Democratic party registration. The two candidates that appeared on the Republican side only received about 22% of the vote at this overwhelmingly Democatic polling place. Of course, turn out is very high at this voting place because most of the voters live there and it is a short walk from the Dinning Room to the voting place. Therefore, the notion that this was a non-partisan result is absurd. In fact, quite the opposite is true. The only reason that Do/Lindner won is because of heavy turnout in a highly democratic precinct. As for as the claim that the Do/Lindner campaign was “honest” well, we will have to agree to disagree on that one. I read the e-mails from a candidate containg claims that were not true. I’m not in favor of revisionist history. Dear Observing: I never said that this was non-partisan. In fact, I think it was quite partisan….from the Republican standpoint. The fact that Do/Lindner prevailed in the absence of any party money like Trigg/Murphy/Jones had is astounding. Do/Lindner did not benefit from any well-organized Republican fundraiser like occurred at Carraba’s for Trigg/Murphy/Jones. Do/Lindner did not have the well-oiled Republican machine working in their favor which is spearheaded by Dominic Peliggi who, just happens, to be Frank’s wife’s boss. Do/Lindner did not have a candidate like Frank Murphy who just happened to be knee-deep in Aston Republican politics on the Aston Board who without any real personal knowledge of the Unionville community ends up on the UCFSD Board and just happened to become Vice President of the Board all within about 14 months. Do/Lindner volunteered in the schools, coached teams, and talked to their neighbors and made friends with the parents in the school. I think they ran a clean campaign. If I had been running their campaign, I would have slammed them hard for the Executive Session issue as Greg could easily have done when the noise issue occurred and he was told by the LWV moderator to start over again on his answer. I’ve always liked Timotha so I never said a word about the obvious disconnect between her not having a college degree while being so intimately intwined in what the curriculum should be in UCFSD. Kathy had a perfect opportunity to slam her for that and she declined. Nobody slammed Sharon Jones for her experience being limited to her Republican Committee ties or for not seeing her at Board meetings or at the school. I was surprised at the easy shots they never took. I thought Lindner/Do were guilty of too much hyperbole as they made reconfiguration sound like the Civil War separating brother from sister, etc. I certainly would never have thought that the type of campaign Do/Lindner ran would have been successful. Do/Lindner had Republican moms and dads working for them and that is what made them successful. If you look at who supported Trigg/Murphy/Jones, it was the Republican Party faithful; not the Moms and Dads in this District. I now believe that if there had been another candidate, Frank Murphy would not have won. I really have to hand it to the Moms and the Dads who went out and voted. The people at Crosslands are often retired educators or the spouses of retired educators. They care about education in a way that is more reflective of their past lives spent in education and not one political party. Greg Lindner did well at Crosslands when he ran before. I heard that Frank didn’t do well in his Crosslands appearance so that did not gain him any votes at that location. It isn’t a matter of a bunch of dottering old people toddling into the voting booth next to plates, rather it is a group of retired, educated, intelligent, active people who have devoted much of their lives to the cause of quality in education. That part is not partisan and never will be. “I never said that this was non-partisan. In fact, I think it was quite partisan….from the Republican standpoint.” Of course, you ignore the fact that the only precinct Do/Lindner won was overwhelmingly democtratic. “Do/Lindner did not benefit from any well-organized Republican fundraiser like occurred at Carraba’s for Trigg/Murphy/Jones.” Do/Lindner had fundraisers, too. What’s your point? “Do/Lindner had Republican moms and dads working for them and that is what made them successful. If you look at who supported Trigg/Murphy/Jones, it was the Republican Party faithful; not the Moms and Dads in this District.” Actually, I have looked at it, and it’s wrong. Do/Lindner won for exactly one reason: Crosslands. It is overwhelmingly democratic and they showed up (easy to do as they are retired and can walk to the polling place easily. “It isn’t a matter of a bunch of dottering old people toddling into the voting booth next to plates, rather it is a group of retired, educated, intelligent, active people who have devoted much of their lives to the cause of quality in education. That part is not partisan and never will be.” So the pary registration of those people doesn’t matter, because they are nice old retired teachers who happen to agree with you, but the party registration of the nefarious “Republican machine” does? I think you should know that the party affiliation of Precinct 453, Pennsbury North 1, better known as Crosslands, is not overwhelmingly Democratic but closer to 45 R and 55 D. Another correction to your post – there was certainly NOT a near 100% voter turn out at this polling place, though it was better than the others coming in at about 55% turn out. And you do not, obviously, have all the answers. Given that the other 5 polling places are overwhelmingly registered Republicans (i.e. greater than 70% R in each), yet Do/Lindner managed to carry a decent number of votes (from among Republican voters) in each, never being overwhelmed (i.e. never losing in any of the precincts at a 30-70 ratio as party affiliation would have it). The original point made by Ms. Hoover, that Do/Lindner won by running a clean, issue-based campaign and getting to know their constituents and issues by actually being involved in the district, the community, and the schools in Unionville Chadds Ford school district (volunteering, coaching, fund raising, etc. ), seems to have gone by your blinded eyes. The other point made – that Murphy/Trigg/Jones were supported by the Republican machine while Do/Lindner were supported the old fashioned way, through votes gained by hard work and communicating with the people – also seems to have passed you by…or your unwillingness to accept the fact that many of us do not want School Board and School Issues to be partisan. Many of us would like for these elections to be independent of political parties – and in fact should not be supported in anyway by political party money nor should these elections be held at the same time as political elections. Also, you made a list of 5 points to refute Elizabeth’s interpretation of the voting data – each of your points also refutable (but not for now). But must take issue with your point #5 about the Lindner vs Murphy election in 2009 as that win WAS partisan and won by ONE voting block in Chadds Ford by the Chadds Ford Republicans, Mr. Murphy’s newly (at the time) adoptive family since his very recent move from Aston/Media. Quite frankly, your partisan comments are detriment to our democracy and to your party affiliation. Carol: you are entitled to your own opinion but not your own facts. There is not a single precinct in Region C that has a 70%+ Republican voters registration. As to 2009, Murphy won five at of six precincts then, as well. The marigin of Democratic victory in PN2 was larger then the Republican victory in CFT. As to your histrionic attacks on me (who you do not know), I’m not going to wade in the muck with you. Have a nice day! I agree with Kristin. This election is remarkable and does mark a “new day” for this district. It also sends a message to political machines that people do have a voice that can be heard over the money machines that fund school board candidates. Imagine what good the Republican Committee could have done with the money they spent pushing their candidates. School board candidates should be elected based on their expertise, experience and commitment not on the amount of money they have to spend. Congratulations to DuPuis, Do and Lindner on successful campaigns marked with integrity and honesty. They will be a welcome addition to the district. I think it is really a new day here in Unionville Chadds Ford School District. In all my years of being involved in politics, I have never seen one candidate; let alone two, lose an uncontested race. What makes this even more astonishing is that the write-in candidates won this race against the powerful Republican machine politics! They won this race without money from powerful Republican coffers which is just simply unheard of in modern politics. If you look at the votes cast and then subtract those that came from straight party-line votes, then Frank Murphy barely won. If there had been a third candidate, he might not. The final reason this election is so amazing is that they won the election without running it into the mud of campaigns in the modern age. I’m impressed. I think the people really spoke up and that is always good. Happy days in UCFSD! In Region A, there were alo a lot of straight party votes,a nd of course, the R’s outnumbered the D’s with straight party votes 429:171. MacPherson got 56% of his votes (429) with straight party votes, while DuPuis got 17% (171)…so many split their ticket, especially for this race. I personally can’t see how anyone can just pull on elever or mark just one box……too many candidates cross party lines with their views/stances on issues, especially at the local levels. so this was very good to see!! !